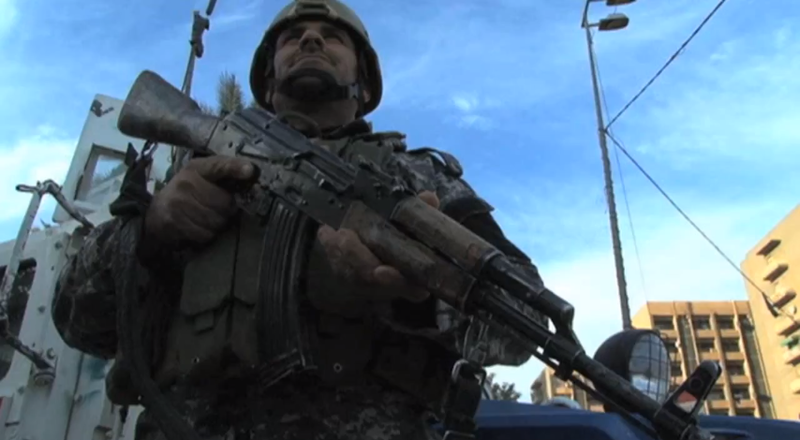 An Iraqi soldier stands guard in Baghdad. Lara Fatah is co-founder and director of Zanraw Consulting and a Global Fellow at Project for the Study of the 21st Century. She is based in the Kurdish region of Iraq and tweets at @Lara_FFatah. Four years ago, when various Arab populations sprung into revolution, the initial impact was somewhat muted in the Kurdistan Region of Iraq (KRI). Whilst there was a reasonable level of discontent with the structure of government and corruption, the history that preceded the formation of the KRG prompted a different public reaction to those in Arab states. Modern Kurdish history has been marred by brutal and bloody episodes, with oppression in all parts of Kurdistan and genocide by the Iraqi state in the last 50 years. A hard-fought level of quasi autonomy was established under the protection of the no-fly zone that the Allies enforced after the 1991 Gulf War, followed by a period of fruitless and costly Kurdish civil war in the mid 1990s. Following the Iraq War in 2003, the new Iraqi Constitution cemented the quasi autonomy and the Kurds found themselves elevated to the lofty position of king makers in a highly divided Iraq. Relations between Baghdad and Erbil have never been warm, but with recent disputes over land, oil and the Iraqi budget, they have been especially fractious in the past few months. The Kurdistan Regional Government (KRG) seized the opportunity to create an island of stability and increasing prosperity within a turbulent Iraq. They established friendly relations with many previously hostile neighbour states – in particular, Turkey, which had not even permitted the use of the term ‘Kurdistan’. With Kurds also holding many high profile positions in Baghdad, including the presidency, a new era had dawned. The Kurds were no longer just the unfortunate victims of the fascist Ba’athist regime; they were now major game players. With this newfound status, and as the money flowed into the region and Kurds reconnected with the outside world after many years of isolation, the level of corruption in the KRG-administered areas also increased. The system in the KRG is based on multiparty elections and is more open compared to other Middle Eastern states which allowed for internal dissent to develop more peacefully as people dared to exercise their democratic rights of mass demonstrations. But the risk of exploitation and outside interference remained a serious threat. Throughout late 2007 and into 2008, the Patriotic Union of Kurdistan (PUK), one of the two ruling parties in the KRG that is led by Jalal Talabani, then president of Iraq, suffered rumblings of internal dissent with many high profile members leaving the party citing a lack of reform. However, the Kurdistan Democratic Party (KDP), the other main ruling party led by the KRG president, Masoud Barzani, had a significantly firmer grip on their rank and files and maintained a united front. These disgruntled PUK members, led by Nawshirwan Mustafa, former deputy secretary general of the PUK, founded the Goran (Change) Movement in early 2009 and went on to win a significant number of seats in the KRG parliamentary elections and in the following year in the Iraqi elections. They were also seen as the main force behind the short-lived protests in Sulaimania in February 2011 that broke out in sympathy with the Arab street. So whilst there was already a growing level of discontent in Kurdistan, the prospering economy and the birth of a new political movement was enough to ensure that the chaos that erupted on the Arab street did not spill over into the KRG. Subsequently, what did spill over were the vast numbers of refugees from Syria and in turn the IDPs from the south of Iraq as the Islamic State of Iraq and the Levant (ISIL) used its successes in Syria to capture vast swathes of Iraqi territory. Suffice to say that the two biggest impacts that the Arab spring has had on Kurdistan is firstly, that it is now home to over 1.5 million refugees and IDPs, which has increased the KRI’s population by approximately 25 per cent, placing a huge strain on the local economy and the available resources. Moreover, some politicians have expressed fear about the possible future impact on the region’s demographics. Secondly and more ominously, Iraq’s Kurds are now the frontline of the global fight against the terror of ISIL. With the Iraqi Army all but collapsing on the northern fronts, the Kurdish Peshmerga and Counter Terrorism forces have been left to hold the line and stop further cities falling into ISIL’s grasp. Iraqi Asad Babil tanks and an M113 APC from the Iraqi Army 9th Mechanized Division pass through a highway checkpoint in Mushahada, Iraq. Many of the refugees who made their way to the KRG from Syria were also Kurds. There has been little to no international response to the crisis as international aid must go through the central government and Nouri al-Maliki’s Baghdad had little interest in helping the KRG secure international aid for the steady and growing flow of refugees from Syria. The KRG found itself increasingly stretched to provide secure camps with medical and educational facilities for the refugees. Some of the refugees, mainly those in the first wave, managed to find work in the main cities, presenting the local authorities with the difficulty of absorbing their children into the already drained education system. This was worsened by the fact that many of the children, although Kurdish, due to the years of cultural suppression under Assad and before him his father, lacked good Kurdish language skills, speaking only Arabic. Very few schools teach in Arabic in the KRG and this has put these traumatised children at a further disadvantage. Locally there have been a number of drives by Kurdish NGOs and media channels to encourage people to donate clothes, food and blankets for the refugees. The initial appeals saw an outpouring of generosity, but the longer the crisis goes on, the less there is to give. With the fall of Mosul last June, the world started to wake up to what was happening. With more refugees entering the KRG, international aid started to trickle in more than in the previous year. It was the fall of Mosul that saw the KRG thrust onto the frontline of the war against ISIL as the Iraqi Army melted away leaving a security vacuum- which the KRG’s Peshmerga and Counter Terrorism units filled in Kirkuk and have held a shaky line on the Northern side of the Mosul Dam. There has also been fierce fighting on the more southern fronts of Jalawa and Khanaquin areas. On the whole, the Peshmerga have held their lines well. Their biggest failure was the disastrous retreat from Shingal (Sinjar) and the ensuing capture of the area by ISIL. The humanitarian disaster for the Yezidi tribes that were living there was well documented in the international media. The plight of those Yezidis trapped on the mountainside became iconic – many will remember the helicopter that crashed into the mountainside when delivering aid. This is arguably what tipped the West’s hand and committed them to aerial battle support. Whilst the Peshmerga have and will continue to fight, they are woefully under equipped. Baghdad has not shared any of the foreign weaponry that has come its way, and it is not unreasonable for certain circles to suspect that Baghdad might prefer it for these weapons to be taken by ISIL rather than share it with the Kurds. ISIL intercepted two of Iraq’s largest weapons caches in Mosul and Anbar during Maliki’s term, and as such, the group is well equipped with the latest US weaponry. Although some foreign aid weaponry has made it to the KRG, it is not enough and, was it not for the US-led coalition airstrikes, it would have been even harder to keep ISIL at bay. The West, for the moment, seems reluctant to truly arm the Kurds, with America and the UK clinging desperately to the antiquated notion of ‘one’ Iraq, when in reality there has never been ‘one’ Iraq. Despite some improvement in relations between the KRG and Baghdad under the new Prime minister, Abadi, in the last two years, relations between the KRG and Baghdad under Maliki were decimated, mainly due to continued disputes over oil and budget shares. This has resulted in no budget being sent to the KRG from Baghdad, which in turn is crippling the KRG’s economy. Recent negotiations between the KRG, led by Prime Minister Nechirvan Barzani, and Baghdad have had mixed results with some improvements in relations, but without the charismatic Jalal Talabani in Baghdad to smooth tensions in the capital – not just between the Kurds and Baghdad but also amongst the Shiites and Sunnis – the problems look unlikely to be fully resolved anytime soon. All the while, ISIL looms large on the horizon. The Kurds gave sacrifice and held on to the besieged town of Kobane by defeating ISIL, but they cannot continue to fight the frontline on bravery alone. Despite protests from some regional powers, including Turkey, the West must acknowledge the role the Kurds have played in halting the advance of Islamic terrorism and defeating them on many fronts in Iraq and Syria. They must help to directly and adequately arm them to win what will inevitably be a long fight and to support what so far has been the only successful example of democracy in action after the fall of Saddam in Iraq. The USA has had a succession of failed policies in Iraq beginning with the creation of a sectarian state to replace Saddam Hussein’s dictatorship and ending with the premature withdrawal of US troops from Iraq. The latter has led to disintegration of Iraq and facilitated the formation and rise of ISIL and their rapid gains, including the acquisition of advanced US weapons of modern warfare. 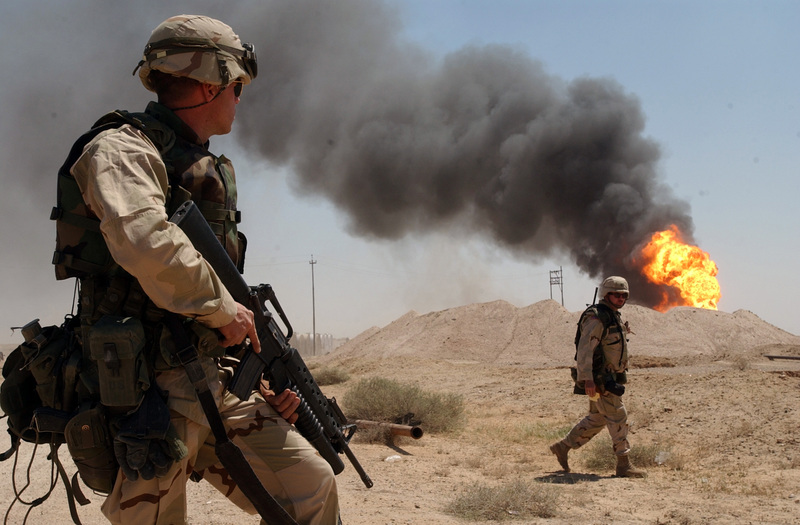 A U.S. soldier stands guard duty near a burning oil well in the Rumaila oil field, 2 April 2003. 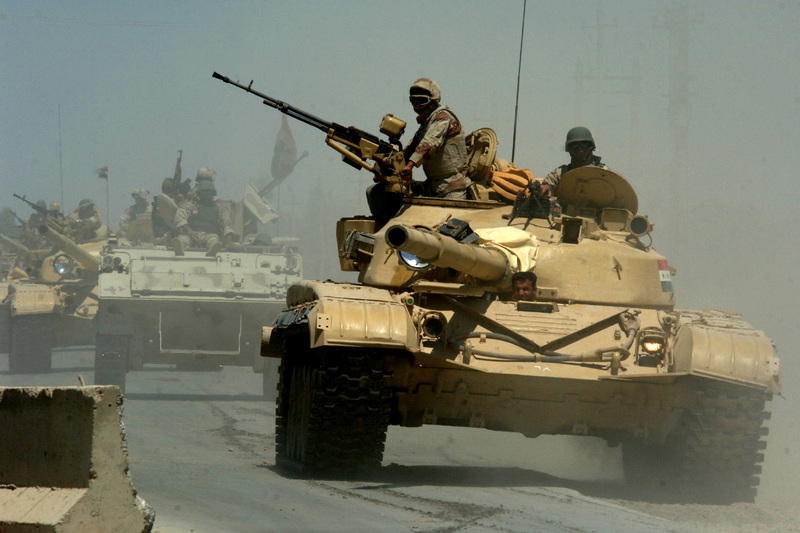 The 2003 invasion of Iraq has been widely criticized. On a regional Kurdish level, ISIL’s aggression towards the Kurds has led to cross border solidarity among the Kurds from the different parts of Kurdistan. Peshmerga from other parts and parties of Kurdistan such as YPG from Syria, PKK from Turkey, IKDP from Iran, and the Peshmarga force of the KRG in Iraq have fought together against ISIL in Kobane in Syria and Shingal in Iraq. This has been a source of great pride amongst the general Kurdish population and has further heightened and increased an awareness and support of a “pan-Kurdish” identity unconstrained by the borders imposed under the Mandate. No doubt this has also alarmed the countries amongst which Kurdistan is shared. The second positive outcome from the current situation is the growing discussion in the international community and media that Kurdish independence may be a possibility. Is it likely right now? Probably not, but in doggedly fighting a global terror force when the state army ran away, the Kurds are demonstrating that they cannot and should not be ignored. Many will say that geopolitics will not allow for the creation of a Kurdistan. The international order insists on keeping Iraq united and hence the excuse for not arming the Kurds in Iraq directly. Ironically, saving and preserving Iraq as a unified country represented by an inclusive and representative government in Baghdad is best served by recognising and admitting that the road to defeating ISIL as a force and saving ”Iraq” is best achieved if the United States and the West deal directly with the Kurds as the most trusted ally and effective ground force available in the region. The recent brutal scenes in Kobane and Mount Shingal have further sparked the idea of a common destiny in the minds of the Kurds across current state borders; it would serve the long-term interest of the “free world” and western democracies to take note. Project for the Study of the 21st Century is a non-national, non-partisan, non-ideological organization. All views expressed are the author’s own.